Today, I am happy to welcome Meghan Walker from Tandem Literary to Booking Mama. She has written a fantastic guest post about tonight's 55th Annual GRAMMY Awards® and why, as book lovers, we should be interested! Make sure you also check out the great giveaway for this year's Best Spoken Word Album nominees! So the 55th Annual GRAMMY Awards® are tonight. As lovers of the written word and great storytelling, what is the book lover’s role on “Music’s Biggest Night?” To groan as we listen to the pop idol du jour butcher the English language? No! Why, it is to root for your favorite audiobook, of course! Each year The Recording Academy gives out an award for Best Spoken Word Album. Thankfully, this does not mean recognizing an aging TV star for his dramatic reading of a Beatles song. It means books, people! This year the five nominated titles in this category are: American Grown by Michelle Obama; Back To Work by Bill Clinton, Drift by Rachel Maddow, Seriously... I'm Kidding by Ellen DeGeneres, and Society's Child by Janis Ian. In each case, the nominee is the “label,” which means the publisher. The odds are stacked in favor of Random House Audio/Books on Tape as three out of the five nominees (Obama, Clinton, Maddow) are theirs. But the big prize could just as easily go to Hachette Audio for the DeGeneres title or to Audible for the Ian autobiography. Dan Zitt is the Director of Master Recording at Random House Audio. He declares this year’s race too tough to call. Political books have fared well in past years—titles by Bill Clinton, Barack Obama, Al Gore, Jimmy Carter, and Hillary Rodham Clinton have all taken top honors. However, comedy is also a perennial favorite. Last year’s winning audiobook was Betty White’s memoir, If You Ask Me (And Of Course You Won't) and the 2010 GRAMMY® went to The Daily Show With Jon Stewart Presents Earth. But Society’s Child could run away with it. The Recording Academy has shown the love to celebrity memoirs from Michael J. Fox, Ossie Davis & Ruby Dee, and Quincy Jones over the past decade. The GRAMMY Awards® ceremony at STAPLES Center in Los Angeles (and even the pre-telecast where the Spoken Word award is doled out) is a far cry from your typical east coast publishing trade show or wine and cheese author party. But this year’s GRAMMY Awards® will not be Dan’s first time at the big dance. So what is it like for the publishing folks who get to partake in the GRAMMY® glitz and glamour, rubbing elbows with the likes of Bruce Springsteen, Adele, Paul McCartney, and Beyonce? Having won a GRAMMY® Award before (in 2005 for President Clinton’s My Life), Dan reports that he keeps it on a shelf at home next to some pictures of himself with some of the more interesting people he has had the opportunity to work with over the years. “None of my friends believe that the GRAMMY® or the pictures are real,” he says. But, still. Dan is not quick to take credit. 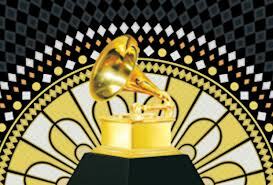 The Recording Academy sets the nominees for each nominated title based on strict guidelines. So, is it an honor just to be nominated? Well, yes. While books may not take center stage at the GRAMMY®s, at least they are invited to the party. Rock on for that. Giveaway alert: To celebrate audio books and 55th Annual GRAMMY Awards®, I have a wonderful giveaway! One lucky winner will win a set of the five audio books nominated for the Best Spoken Word Album. This prize package includes: AMERICAN GROWN by Michelle Obama; BACK TO WORK by Bill Clinton, DRIFT by Rachel Maddow, SERIOUSLY... I'M KIDDING by Ellen DeGeneres, and SOCIETY'S CHILD by Janis Ian. To enter, just fill out the form below before Sunday, February 16th at 11:59 p.m. ET. I will randomly select and notify the winner the following day. This contest is open to those of you with U.S. addresses only. Good luck! It is nice to see audiobooks recognized by the "mainstream." What a great giveaway!! Thanks for the chance to win - I love audio books! This is how I go to sleep each night. Off to Pemberly or Hogwart's, set the timer and I drift off.